I am fundraising to help us build an open-source laser cutter/engraver for engineers, artisans and the bustling Indian textile industry. A couple of friends and I are raising funds to build a laser cutter/engraver working model for our Third Year Mechanical Engineering Project Work. From this project, we will build a larger prototype. We strongly believe that engineers, PCB designers, hobby enthusiasts and artisans can benefit by having a low cost laser cutter/engraver, to which they can upload their creative designs using vector drawings or using G-code (CNC). We're using a 200 mW laser that can cut through paper, Styrofoam, thermocol, etc. 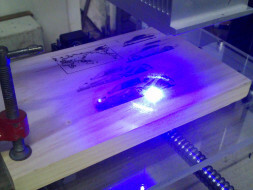 and engrave on wood, metal, hard plastic, etc. We're going to utilize the money to buy laser diodes and driver circuits, stepper motors with drivers and lead screws, arduino/raspberry pi as controller and to build housing for the device. We also need to buy laser safety goggles. After we're done designing and implementing this project, we plan to make it open source and writing a DIY article on Instructables.